Besides the feeling that this is how every three-month DL stint begins for the Mets, we can still afford to be optimistic that Torres will be ready for Opening Day in two weeks. 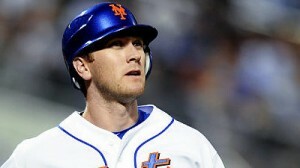 The bad news is that with backup center fielder Scott Hairston sidelined with a strained oblique, the Mets are considering putting Jason Bay in center field. Really? It’s hard to believe there are no better options than putting a just-adequate fielding left fielder like Bay in center. 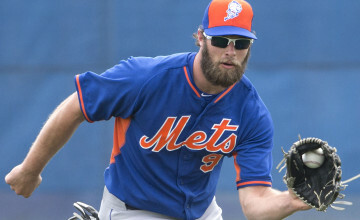 I know I and at least a few other fans would like to see Kirk Nieuwenhuis given a shot at the position this season, but he is also working his way back from an oblique injury. That leaves Bay, Adam Loewen, Mike Baxter and shortstop prospect Jordany Valdespin as the top candidates to start in center on Opening Day if Torres isn’t ready by then. “I don’t know if I’m going to be the best center fielder in the league,” said Bay when discussing a shift to center field, “But if it gives us a chance to get other guys in certain spots, I feel I can do it.” Technically, Bay has played center field in the majors before, but that was way back in 2005, when he was 26 years old. At least Bay can hit big league pitching. He hasn’t hit it nearly as well as he used to, but he’s had a lot more experience than Baxter or Loewen in recent years. Valdespin has reportedly never played in the outfield as a professional. So, what are the Mets to do? Adding another cook to the kitchen at this stage doesn’t seem prudent. If Torres’ calf turns into a lingering issue, you’d like Nieuwenhuis to be able to get some major league experience, especially if the if it’s August and the Mets are out of it. For now, it seems like the right thing to just hope Torres gets healthy in time for the beginning of the regular season. The worst case scenario would be starting a non-center fielder for a week or two. The lineup would still look less silly than the one starring Gary Matthews Jr. and Mike Jacobs that the Mets trotted out on Opening Day two years ago.